I cannot believe it's week 3 already! I'm surprised the outfits this week were even half as decent as they are since my mind was basically mush as I lunged through the week like a zombie through my endless cycle of sleep, work 10+ hour days, and repeat with scattered meals in-between. Even on the weekend. Thankfully Mr. Artist is so laid back that he'll still count me being unconscious the whole time we hang out as QT still. I wonder what he's doing while I'm sleeping?? Anyhoo here's how week 3 went! Remember, you can follow all the lives updates on my Twitter and by searching the hashtag #365outfit! My hair actually looks pretty decent here! In all seriousness though, can anyone recommend a reasonably priced, good stylist downtown?? 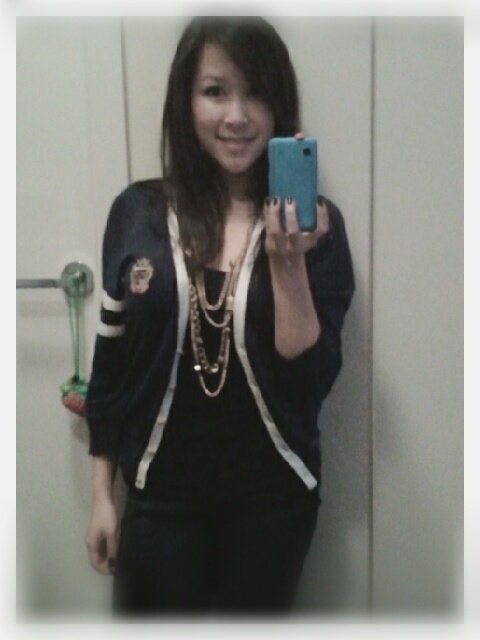 I also looove this cardigan. Sure the whole preppy thing might not be too hot right now, but I really don't give a damn. It's prepster stripes and crest make my heart all fuzzy inside. I was in a really comfy mood this day. 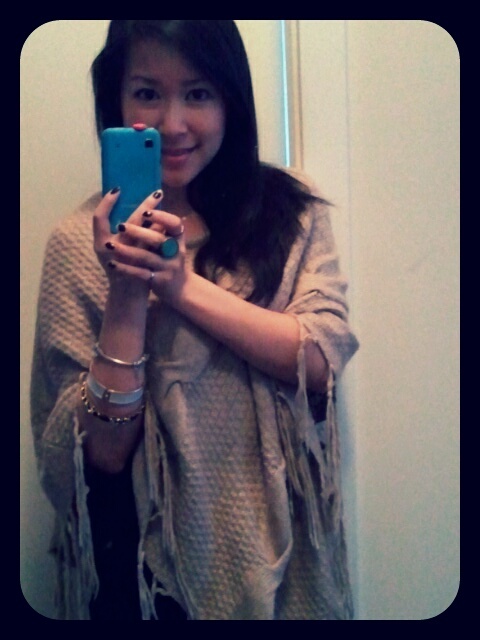 I like how piling on jewelry and a slouchy top can count as stylish. Derelict at its best! 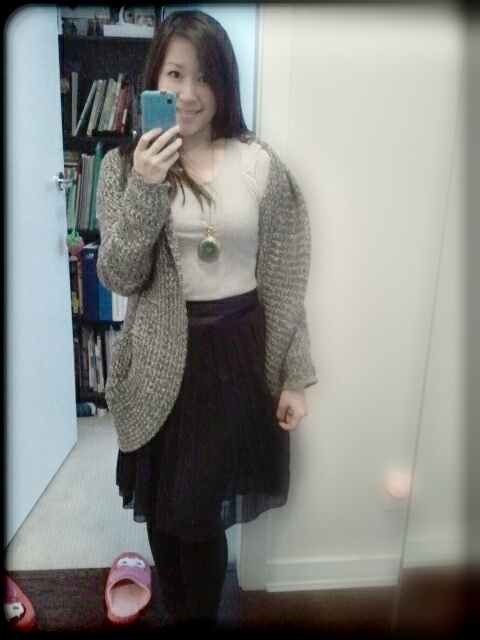 Grey beater: swapped | Tee: Club Monaco | Skirt: H&M | Sweater coat: Urban Outfitters | Locket watch necklace: Front & Co. I always seem to get compliments when I wear this pleated navy skirt. It's quite nice and swingy and great as a transition piece as it's not too short to expose bare legs to cool breezes. Lots of layers kept me warm as I needed the sweater coat for walking to/from work, but had to throw it off in my stuffy office. I like trying to do layers that are unusual, like this racer-back tank over top of a taupe t-shirt. It's a style I see a lot of in Asian magazines, but not so much with the locals here, so it makes one stand out a bit. For some reason the toque is what makes this outfit for me. 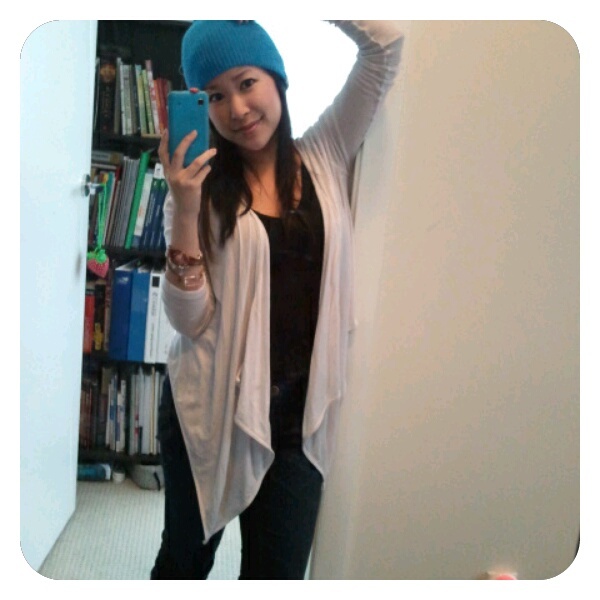 I'm really into toques this season and this bright blue one was the replacement bought very sweetly for me by Mr. Artist's mom (let's call her Momma Artist) after Mr. Artist's dog, Ecko, ATE my previous one! Seriously to all the dog owners out there, I know you'll feel my pain. One second my favourite blue toque was lying innocently on a chair minding its own business. The next, it was ripped to shreds, its guts spilled across the carpeted floor by this golden, squishy terror. Just when we begin to think we've rounded the bend with the winter weather, Mother Nature throws us another bout of the freezies. My strategy this year is to walk as fast as I can, wearing as many layers as possible around my core, like with this chunky knit scarf. It's fast become a winter favourite this year and for sure, many years to come. 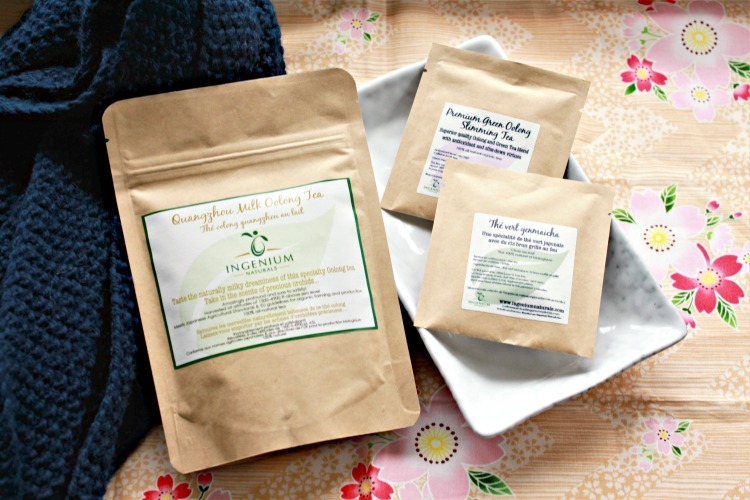 Items like this are an essential for Canadian winters. Stay tuned for next week's recap and remember to follow me on Twitter for daily updates! ooo love the hat and the cozy sweaters! 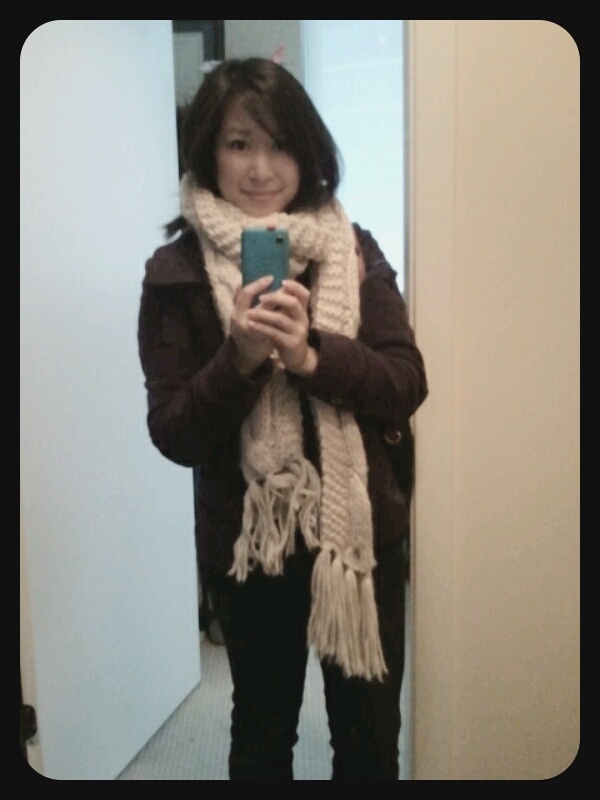 Love the scarf and wool coat~ Good job on week 3!